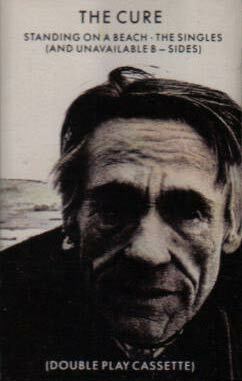 "It feels like one hundred years..."
I can actually remember the exact moment I became a fan of The Cure. It was in 1986, and they had just released their first singles compilation - 'Standing On A Beach'. A friend used our 80's style peer-to-peer network to swap the music files with me i.e. he physically lent me his cassette of the album. Double-play edition with extra unavailable b-sides no less. I was on the 34 bus. The route ran as far as Whipps Cross then, and I was on my way home from school, listening to it on my Sony Walkman. I was sitting on the downstairs backseat of the bus. I was somewhat underwhelmed by the opening three tracks, but I distinctly recall being at the traffic lights by the old Co-Op building on Hoe Street when I heard the opening of 'A Forest' for the first time, and I was hooked. One of the reasons I really wish that we had invented the ability to time travel by now is because I'd love to be able to project myself back to that moment. 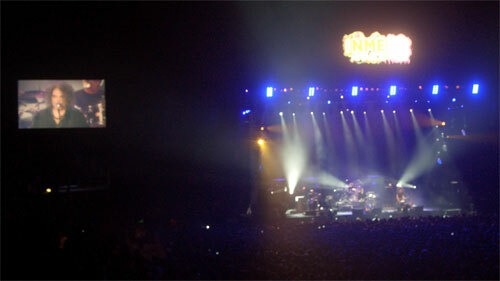 I'd tap my younger self on the shoulder, and let him know that in 2009 I'd be watching that very same band play that very same song live in a massive futuristic dome on the south bank of the River Thames. 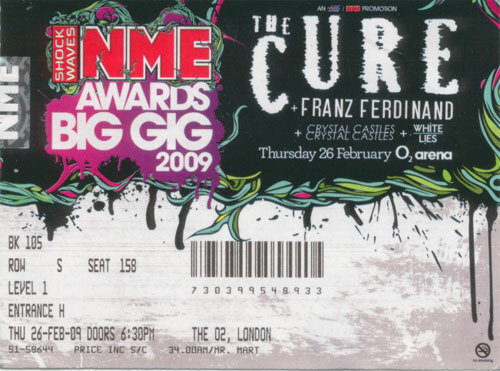 Because, despite 2009 being unimaginably far away to a 15 year old in 1986, on Thursday I was at the re-branded Millennium Dome for NME's Big Gig with White Lies, Crystal Castles, Franz Ferdinand and The Cure. As a Cure gig I have to say that I found it a little bit below par. They are currently performing as a four piece, which means no keyboard player, and on songs like "In Between Days", "One Hundred Years" and "From The Edge Of The Deep Green Sea" the keyboard parts were noticeably missing. However, just as my better half and I were discussing this after the main set finished, they came out for an encore where The Cure partied like it was 1979, playing "Boys Don't Cry", "Jumping Someone Else's Train", "Grinding Halt", "10:15 Saturday Night" and "Killing An Arab", and so we went home gleefully delighted. Oh, and if I did get to travel back in time to meet that 15 year-old version of myself on the bus, I'd be able to reassure him that, in the future, I would still be wearing green faux-military style jackets. By Martin Belam on 1 March 2009.